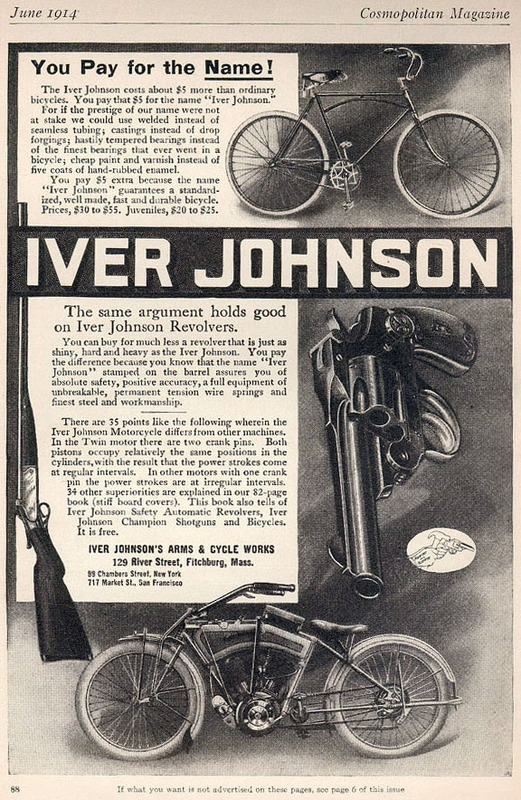 Iver Johnson was a leading player in both the bicycle and arms industries, and its growth coincided with the birth of the advertising industry. Witty adverts and dynamic advertising material were the trademark of the time. 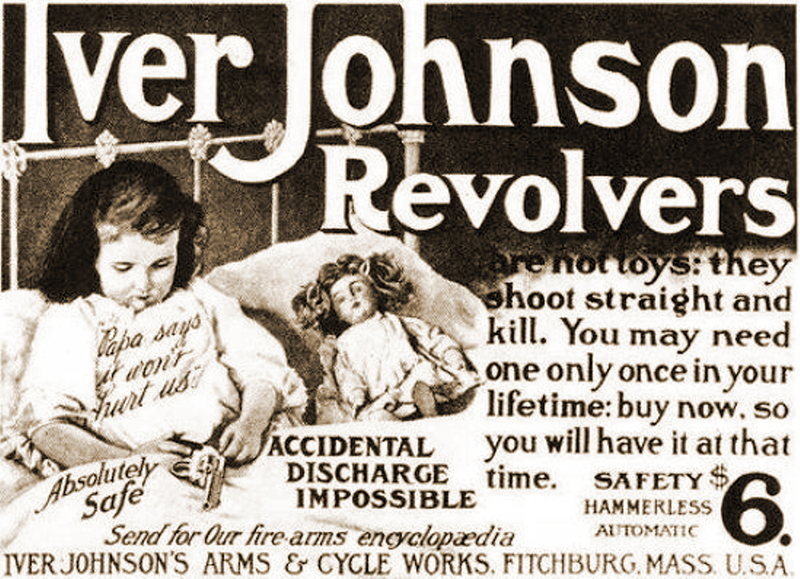 The Iver Johnson’s Arms & Cycle Works developed snappy slogans for its two most important patents, the Truss Bridge bicycle frame and the Hammerless Automatic pistol. The Iver Johnson Truss Bridge Frame bicycle – the company’s headlining machine – was accompanied by the motto TRUST THE TRUSS. COCKED BUT LOCKED was another catch-phrase used to illustrate that it was not possible to accidentally discharge the gun. The advert below showing a young girl in bed with a pistol in her lap is probably the ultimate in bad taste in this genre. The Smoker pistol below was manufactured by Iver Johnson around 1880, when his company was called Johnson & Bye. Major Taylor was the world champion cyclist who was cheated by the American Cycle Racing authorities because he was black. But he fought back …and won! This website features Truss Bridge Frame bicycles by Iver Johnson. After 1917, American companies such as Columbia, Haverford (Black Beauty) and others sold similar ‘Arch Bar’ bicycles. Labor used a similar design in France. The style was not popular in Great Britain, though F Hopper advertised one. You can also see Iver Johnson guns, ephemera and adverts, and a page on Major Taylor who was Iver Johnson’s most famous racer. In addition, there are Truss Frame bicycles – a term which includes those using the Fowler patent (twin seat tube/open bb) and also the style adopted by Premier in England (1905) and Lovell Diamond in the USA (1909) – a double top tube with the lower tube sloping towards the from crown. After the turn of the century, Elswick used the name for their cross-frame bicycles. After the original Iver Johnson ‘truss bridge’ patent expired in 1917, other companies brought out their own truss bridge models. Columbia made a prototype ‘Arch Bar’ model featuring their version of the ‘Truss Bridge’ frame in 1904 (see below); however, to avoid patent infringement, they could not advertise it until 1917. This particular prototype also has cushion suspension and shaft drive. The Iver Johnson catalogue illustration above it has an even more shallow angle, so presumably shows an 18″ or 20″ frame. A truss is an extra support: the description ‘truss frame’ is very general, and can include an extra bracing tube anywhere within the frame diamond. The Lovell Diamond Truss Frame Roadster (above) first appeared in the company’s 1909 catalogue. The design was already in use in England; the 1906 Helical Royal Premier (below) has an even more accentuated truss tube than the the Lovell Diamonds due to its large 26″ frame.